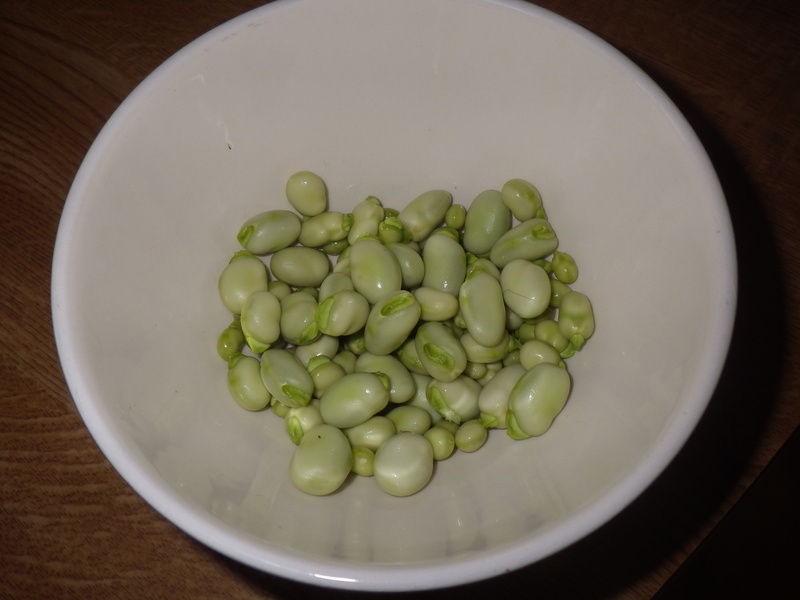 I know that it is entirely the wrong time of year to be harvesting broad beans, but I am… well, field beans at least. Once again this year, I didn’t plant my bean seeds at the right time. I know that you can plant broad beans in the autumn for a nice, early crop the following year, but it doesn’t seem to work well round here. I think it is because it’s usually so wet over the winter, and the seeds tend to rot before they germinate. As a result, I try to plant my beans in the spring. This year, however, it was so cold in March that somehow it didn’t get done, and I ended up planting my runner and broad beans at pretty much the same time. Fry a finely chopped onion in oil until soft, add some chopped pancetta and allow that to crisp up, then toss in some fresh broad beans and allow them to cook through. Hugh eats his beans cooked this way on toast, but I like to serve this with sautéed potatoes cooked with paprika and garlic mayonnaise… yum. It’s a recipe that you could equally use for thinly sliced pole, runner or French beans. Even reading your blog these days increases my waistline. I have to diet, just not sure what colour yet. Good job you don’t live closer, otherwise you’d be able to do more than read about the food! and keep those hugs coming! I’m sitting here with my mouth watering! It is a great recipe… and so simple! You are in a blessed situation. As you retain the ability to grow and consume your own fresh vegetables. Most folks like me can never enjoy this luxury! It’s true… we only have a little garden, but we try to make the most of the space we have. Growing your own food is something everyone should have the opportunity to do.